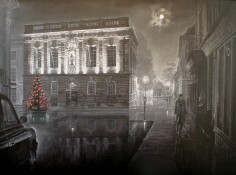 The MITCHELL GALLERY based in Warwick UK commissioned Kevin, the Artist, from 2009, to create a series of monochrome Oil Paintings portraying scenes of some of Warwick’s historical buildings. These images are THE WARWICK COLLECTION. The Gallery closed in March 2018. ORIGINAL OIL PAINTINGS, FRAMED PRINTS and GREETING CARDS from this Collection are for sale.